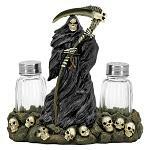 Bring a touch of nostalgia and style into your kitchen or office break room with this Checkmate Spice Salt and Pepper Holder. Designed for chess players and fans alike, this centerpiece is sure to please with it's classic eye appeal. Crafted from highly detailed polyresin, this Chess Salt and Pepper Holder is built to last for years. Even if the Chess Team is the best team on your campus, you can still represent your School Colors! (L x W x H) 7.38" x 5.25" x 5.25"